It looks painful. Cool but painful. Very nice. A colored one would also look good as well. So get a pair of them! 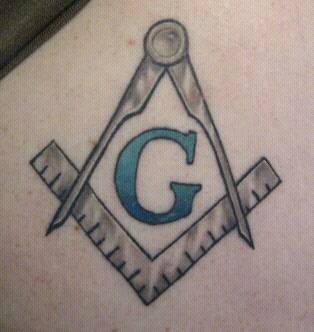 It's not masonic, but my next one will be...Looks familiar doesn't it...Same as my profile picture, just on my bike. who was the ink shooter? Very, very nice work !! Take good care of it, Brother. My first tattoo (I couldn't think of anything more appropriate to start out with, there's a lot of meaning behind it for me), done the day after I was Raised (11/6/09). Ink by Zeo at Studio 8 Tattoo on Westheimer in Houston. About 3.5"x4" on my right shoulder. It inspired one of the other members of my Lodge to get some work of his own done. guys who are coming into inquire or going through the petition process. I plan on eventually turning it into a Masonic-themed half-sleeve.